Sana Salman (Riffat & Sana) has launched its screen printed swiss voile ready to wear summer collection 2015 for women and girls. Sana Salman stitched collection is in stores now at all big clothing outlets in all over Pakistan. This is ideal women collection which you can wear on parties and special functions. This is must have screen print swiss voile summer designs for women. Sana Salman is the fashion label by fashion duo Riffat and Sana. Both are emerging fashion designers in Pakistan fashion industry. They always designed dresses as per the customer requirement. Sana Salman swiss voile summer collection includes net silk shirt cuts and dyed pants with printed chiffon dupatta pieces. The brand introducing finest quality fabric and embroidery designs in diverse color tones like royal red, sky blue, green, parrot, brown, orange, yellow, purple, pink and black. The brand posted all its catalogue which includes all designs pictures on its facebook page. Here, teams of Fashion Runway is going to share complete catalog of Sana Salman Summer Ready to Wear Collection 2015 for ladies. The collection is very stylish and stitched as per most recent fashion trends, women and girls can wear this collection on parties as well as casually. Check here Pakistani fashion designer Sana Salman (Riffat & Sana) Summer Swiss Voile Collection 2015 Prices. 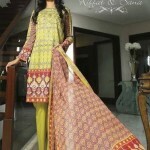 Let’s see complete designs range of Sana Salman Swiss Voile Collection for girls. 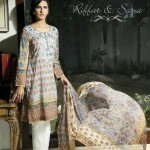 Sana Salman (Riffat & Sana) Swiss Voile spring summer collection is ready for sale now at all leading stores nationwide. The brand have 2 flagship stores, one in Lahore and other in Karachi. Here below we are sharing with you complete designer stores detail and phone numbers. Please send us your feedback regarding this collection, stitching styles, prints and embroidery motifz by posting the comment at the bottom of this post.